Welcome to my Spray Tan Tool Kit Series! A section of my blog where I talk about what spray tan equipment I use or have used and what I like or don’t like about it. My hope is that these articles will help you in your search for the best spray tan equipment for your business, giving you a system that you can work off of for all future shopping. And because shopping for new toys is FUN! Within this post there may be affiliate links to the products I am referring to. If you purchase a product through one of my links it will NOT cost you anything. Read my full disclosure here. Hi, I’m Kathryn owner at SunSpray by Kathryn and if we haven’t met before and you would like to get to know me a little bit and check out who I am and what I do…..(Answer: Lots of spray tans!!!!) Then head over to my About page so we can get to know each other better. Already know all about me and are ready to dive in, then skip down to get into the details!! If you are new to the spray tanning industry and are not sure what you need or what exactly you are shopping for, no worries, I have you covered. START HERE: On my equipment page where I walk you through exactly what features to consider looking for in your spray tan equipment. This will get you up to speed on how the basics work and then you will have the confidence to make an educated choice. Then head back over here and check out a few of my reviews so you can see exactly what I am talking about. You can find the Fuji 2150 on Amazon. I have to admit that this was my dream spray tan machine that I REALLY wanted for a LONG time. It’s a bit on the pricey side so I had to save my pennies to upgrade to this spray tan system. Was it worth it? But there is a little something to consider before taking the plunge. Let me explain. There are HVLP spray tanning systems out there that can handle all sunless tanning solutions regardless of how thick or thin they are. This in my opinion is NOT one of those systems. I use several spray tan solutions in my studio. Some of them are very watery and thin and several of them are a thicker consistency. The Fuji sprays the thin solutions like a dream! The thicker solutions tend to bog down and cause the turbine to struggle actually resulting in me overheating my first unit and killing it. I have a bad habit of doing this. Luckily it was still under warranty and was replaced in a snap. Absolutely no issues with getting a new system at all. Way to go Fuji for having GREAT customer service! If you are using a thinner solution I recommend that you seriously consider this system. Just know what spray tan solutions it can handle and what it can’t. To handle my thicker spray tan solutions I purchased the MaxiMist TNT Pro Spa Unit. 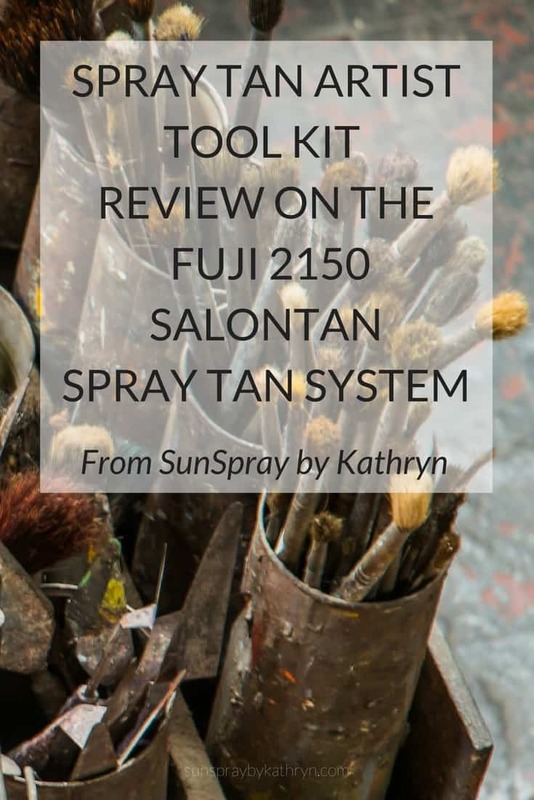 The Fuji 2150 salonTAN is a great spray tanning system. I would consider this a pro level system and gun. It is easy to set up, comes with the TAN7350 spray tan gun and I love the quick connect on the hose, no popping off your gun or the turbine mid spray. Connect the hose to the HVLP compressor and the spray gun to the hose, turn it on and you are ready for your first spray tan. The first thing that you will notice it that it is QUIET!!!! Oh, sweet peace and quiet!!!!! When you spend your days in a room with a compressor running continually this is pure bliss! Did I mention its quiet?!!! The Fuji 2150 salonTAN is a salon or studio system. I appreciate the simple box design making it easy to wipe any spray tan solution overspray off to keep it clean. The filter is easily accessed for nightly rinsing. There is a handle on the top and a spray tan gun holder to easily set your gun down if needed. At 23 lbs. I would not recommend this unit for a mobile business. The aluminum Spray Gun is professional looking and easy to clean. Even though I managed to overheat and seize up my first Fuji 2150 salonTAN, I would consider this a well-made machine. I have had no problems with my second unit, keeping in mind that I do not run my thicker spray tanning solutions thru it any longer. The TAN7350 spray gun that comes with the Fuji 2150 salonTAN is very lovely! LOL Yes, I have relationships with my equipment as I have it in my hand for hours during the day. It is not heavy even loaded with spray tan solution giving me the control I need to apply a flawless tan and not have a very tired arm at the end of the day. The gun has a very smooth almost airbrush feel to the spray pattern. It reminds me of a larger version of my very loved Badger Airbrush from the early days of spray tans. Can you believe we used to do a whole spray tan with that tiny airbrush??? The Fuji Gun makes contouring and detail work easy with the adjustable pattern control knob on the back of the gun. It also has VERY little overspray. Which means less mess for me to clean up daily=happy spray tan lady! I LOVE that all of the parts for this gun are available to purchase which means that if something does break or get worn out the part is easily replaced and I DON’T have to buy a whole new gun or new spray tan system. Another reason that I love the Fuji line of spray tan equipment. The only thing that I don’t like about the TAN7350 Fuji Spray Tan Gun is that the hose connection is on the bottom of the gun. I actually prefer the hose connection on the back of the gun assembly but it is becoming increasingly hard to find that set up. You do have to adjust your spraying style slightly during downward strokes on the lower legs and feet. If you are a new spray tan artist then this won’t be an issue for you. The spray speed on the TAN7350 Spray Gun is adjustable allowing you to set your spray tan solution flow to the speed that suits your style and level of skill. For entry level spray tan artists, a slower spray speed is preferable until you get your spraying routine down. I do feel that this gun requires a bit more practice to get the hang of it but delivers a superior tan over basic gun options once you have gotten comfortable with it. The Fuji 2150 salonTAN comes with a 24 month warranty on the complete system. I love my Fuji 2150 salonTAN! This spray tan system is pricey but so worth it. If you are ready for an upgrade to your sunless equipment or are considering this as your first spray tan machine I say go for it, your ears and your clients will thank you. 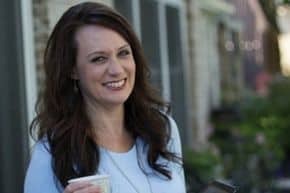 Having used the Fuji 2150 for several years in my spray tan business, and having several spray tanning systems in my business, it is definitely one that I reach for first. You can check the current price for the Fuji 2150 spray tan system here on Amazon. Please keep in mind that I am NOT a spray tan equipment distributor nor am I trying to sell you on any brand. This is how I evaluate each piece of equipment before I purchase it and bring it on board into my busy sunless tanning business. Equipment, solution and retail products that are listed come with my personal opinion as a spray tan business owner: the good, the bad and the ugly. You must evaluate what is going to work best for your business.